Rick tells Shane about his doubts, staying as close to the city as they are but Shane dismisses them. Rick decides if they have to to stay they all need to be armed so he and Glenn head to the city to get guns. Rich and Glenn ask Jim where the closest gun store is and to their dismay they find it far into the city. The two men decide to go anyway and on the way Glenn tells Rick about how Jim got out of the city, Jim's family had acted as a human shield for Jim and he saw them get ripped apart as he escaped. Rick has an idea to keep the undead away, he smears blood from a dead zombie all over his and Glenn's body. Rick's idea works and they are not bother by the zombies as they walk to the gun store. Finding a shopping and filling it they head back to the camp but it begins to rain and washes the blood away from them. Running out of the city Rick gets bitten but his leather jacket protects him. As Lori waits in the rain for Rick, Shane tries to comfort her and talks about a night they shared but Lori tells him that was a mistake and now that Rick is back he needs to let it go. Rick tells Shane about his doubts, staying as close to the city as they are but Shane dismisses them. 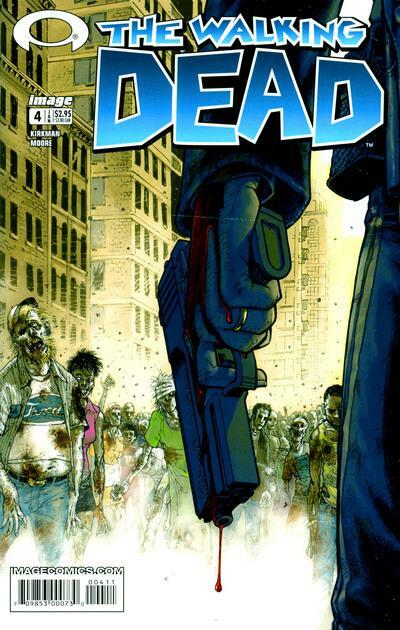 Rick decides if they have to to stay they all need to be armed so he and Glenn head to the city to get guns. Rich and Glenn ask Jim where the closest gun store is and to their dismay they find it far into the city. The two men decide to go anyway and on the way Glenn tells Rick about how Jim got out of the city, Jim's family had acted as a human shield for Jim and he saw them get ripped apart as he escaped. Rick has an idea to keep the undead away, he smears blood from a dead zombie all over his and Glenn's body. Rick's idea works and they are not bother by the zombies as they walk to the gun store. Finding a shopping and filling it they head back to the camp but it begins to rain and washes the blood away from them. Running out of the city Rick gets bitten but his leather jacket protects him. As Lori waits in the rain for Rick, Shane tries to comfort her and talks about a night they shared but Lori tells him that was a mistake and now that Rick is back he needs to let it go.